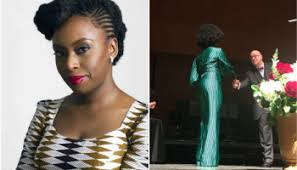 The golden girl of Nigerian literature, Chimamanda Ngozi Adichie has won yet another international award. Her work, “Dear Ijeawele, or a Feminist Manifesto in Fifteen Suggestions” emerged one of three winners of Le Grand Prix de l’héroïne Madame Figaro. The prize, in its 12th edition, was established in 2006 by the French magazine Madame Figaro to celebrate heroines of French and foreign literature. Each year, the shortlisted works are selected by the magazine’s editor. A team of judges, chaired by influential journalist Patrick Poivre d’Arvor, selected one French novel, one foreign novel in translation, and one nonfiction work. “Chère Ijeawele, ou un manifeste pour une éducation féministe,” the French translation of “Dear Ijeawele,” was selected as the winner in the latter category. Along with Adichie, Alex Stresi was awarded the prize in the French novel category for “Lopping” and Lauren Groff received the foreign novel prize for “Les Furies”. Adichie’s French publisher, Marie-Pierre Gracedieu of Gallimard, reacted to her feat: “When I read Dear Ijeawele, I felt an urge to share it with many friends, women and men, who had become parents of a girl in the recent years. Then I started to feel it had to be read by parents of boys too. And thereafter by every one of us to investigate our own education, and try to overcome a few inherited clichés. “Therefore, to publish it at Gallimard has meant a lot to me, and it is a very rewarding experience to see it awarded the Grand Prix de l’Héroïne by Madame Figaro, a prize that celebrates the power of literature and of characters as role models.